Cardboard boxes seem like the most common item in the world... until you actually need some. If you're planning a move to one of our Springs luxury apartment homes, here's a list of places where you can score free boxes along with creative suggestions for alternatives. With the number of shipments they receive, grocery stores are one of the more dependable sources of empty boxes. Look for banana boxes and other produce shippers that are extra sturdy and often come with lids. 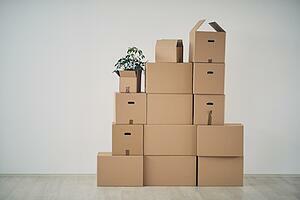 Liquor boxes are perfect for moving items such as books, CDs and DVDs. People have discovered that McDonald's French-fry boxes are so versatile that there's an actual Facebook page extolling their virtues, with moving boxes topping the list of uses. Did you know that Craigslist is a surprisingly plentiful source of boxes? Select the "Free Stuff" heading and search for "cardboard boxes" or "moving boxes." As a bonus, you can sometimes find free packing supplies such as bubble wrap and peanuts. U-Haul has created forums for people who are moving to share rides, moving trucks and storage. Their Box Exchange is helpful for locating boxes and passing them along once you're done. Neighborhood social networks such as Nextdoor usually have several notices from people offering free cardboard boxes. Plastic grocery bags seem to multiply behind our backs. Why not put them to use as packing containers? They're great for odd-shaped items that don't fit well in a box, and they can double as filler. Canvas shopping bags also work well. Use trash bags to pack clothing "freestyle," or simply pull one over a group of items on hangers and then fasten with a twist-tie. Desks and dressers are more easily moved when the drawers are out, so use them to pack knick-knacks and other smaller items that might be awkward in larger boxes. Make a cover from a piece of plastic or bubble wrap. Suitcases don't have to be just for clothes. If the luggage has wheels, it's even better for transporting books and other heavier items. Have you discovered a clever alternative to moving boxes? Share it with us in the comments!